The 45th Annual South Dakota 4-H Finals Rodeo was held Aug. 19-21 at the Stanley County Fairgrounds in Ft. Pierre. 543 South Dakota youth ages 9-19 earned the opportunity to compete at the finals by placing in the top 4 at one of the 36 regional rodeos held throughout the summer. 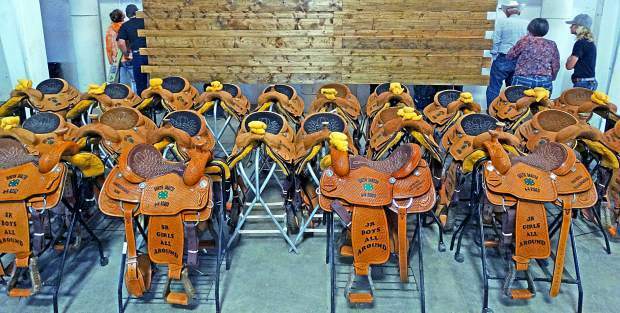 In addition to go-around prizes; 68 buckles and 26 trophy saddles were awarded to the average winners. Morgan Janisch the 18 year-old daughter of Paul Janisch and Julie Nelson was crowned as the 2016 4H Rodeo Ambassador. Ashley Theobald, Riley Smith, Roni Jankord and KeAnna Ward are the South Dakota State 4-H Rodeo $250 winners. Sadee Hurst and Dawson Munger won the Faye Deal $200 scholarships.